If you Google “telegraph-to-tweet”, you will see the story where the Duke and Duchess of Cambridge (Prince William and Kate) had a message sent by telegraph, assisted by 90-year-old Doug Bell, over to Twitter, at a museum in Whitehorse, Yukon last week. This was the first message sent on this telegraph key in the last 80 years. The is awesome and unique. I wonder how the interface was made. Was it send to someone to translate to Twitter or was or was there hardware/software interface to the Twitter account. The newspaper said the technology was developed by a Canadian company called Make IT Solutions. I haven’t bothered to find out how it was done as I am not very technically-minded. When I worked I always had a wire chief to figure things out!! I know Les Kerr was experimenting with a smart phone link to MorseKOB a few years ago but do not think he wanted to get too deep into it. This log building was constructed in 1900 to accommodate the changing needs of the town. The first telegraph office was built in 1899 across the river on the east bank of the Yukon River which was the original townsite for Whitehorse. The town shifted across the river once the White Pass & Yukon Route completed its railroad and situated the station on the west bank. To save on construction costs the doors, windows and most of anything that was removable was stripped from the old building to be used on the new telegraph office. The new building served both as the telegraph office and as the residence for its operators. The head operator, George Fleming, lived in the building until his retirement in 1923 and was succeeded by Bruce Watson who held the position until 1927. At which point the telegraph office was moved to two neighbouring houses which have since been demolished. The log cabin was left vacant and for a short while the RCMP made use of the building in the late 1920s. The Boy Scouts also made use of the building as their headquarters for a few years. In the 1950s the building was leased by the Yukon Historical Society and functioned as the MacBride Museum from 1952 until 1966. As a result of the many functions of this building, there have been numerous and undocumented changes to the building’s interior. This is not uncommon in telegraph offices across Canada, almost none of which have maintained their original interiors. As the telegraph became obsolete, most telegraph offices were renovated and utilized for other purposes. The telegraph line ran from Vancouver through Ashcroft, B.C. to Whitehorse and north to Dawson City along the Yukon River, connecting the Yukon with southern and eastern Canada. The Yukon Telegraph Morse wire from Ashcroft B,C, to Whitehorse was worked and maintained until the 1930’s. If anyone bothered to read the CNet article which was the third link that Chris sent, they would have seen that GMail Tap is a hoaax, created as an April Fools' joke back in 2012 And, if you go to the link to download it, which as given in one of the other of Chris's links, you get an error message saying 'ops, gmail tap is too popular. How can I sue a DTA file in place of a SCP with logger plus? Import the DTA file into medit, and export it as master.txt. We found out a lot of time ago, that we need to disconnect all the USB that are not realy needed. All of dongles, USB memory sticks and other were the cause of many RF issues. The issue with TX is a typical issue with RF getting into the USB, or keyboard or PC. Try putting some RF chokes on antennas, RFI chokes on cables (keyboard, mouse, whatever you have) and dont forget to ground the PC chasis. That way we eliminated most of them. All the USB cables are shilded with 2 torroids (one on each end) with at least 2 turns around the toroid. New entry in the FM-32 Key Census Page. I recently worked Lothar - DL1DXL on 40m, a very good bug operator. We had a nice chat, we talked about bugs and sideswipers. He is the happy owner of a FM-32 key, no serial number on it. Have a look at Martin's - G4ZXN latest creation: the Veroboard Cootie. Congratulations Martin, this thing sounds great! Let's hope for better conditions. Keep up the good work John and have fun on the air with those little gems. FYI, our friend Jean-Claude - F6FCO has updated his website (in French). This fellow is an excellent CW operator, an experienced technician and a talented handyman. 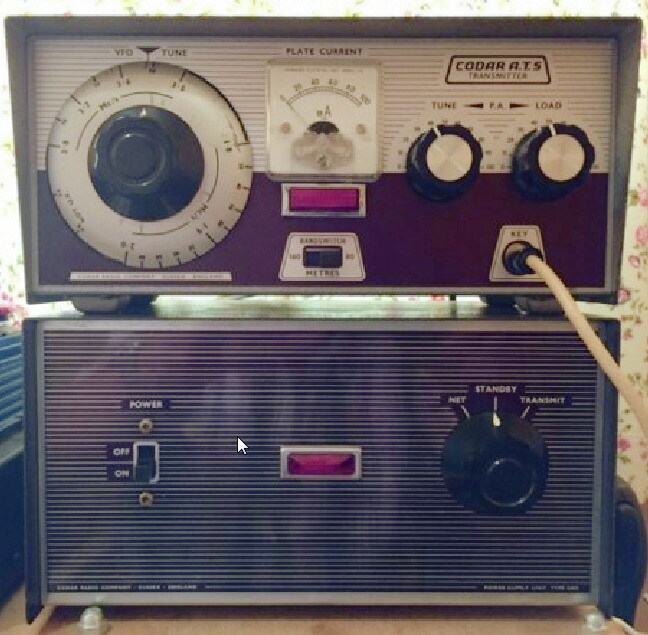 Have a look at his well made DIY stuff, not only radio equipment. Interesting articles, lots of hints and tips, I'm sure you'll enjoy the visit. The enclosed photo may be of interest, it is the Tx/PSU I used for the 80M SSN last evening. Its been sulking in the roof space for about 15 years, drifts a bit.